Researchers Oluwafemi Oluwole and Joshua Lawson have shed light on findings from previous studies that indicated rural children are less likely to have asthma. Without investigating diagnostic explanations, those studies suggested that early-life exposure to dust and other environmental allergens may have protected rural children from developing asthma. "This may not be entirely the case," said Oluwole, a post-doctoral fellow in the College of Nursing. "We found that rural children are less likely to be diagnosed for asthma. As a result, they may have more difficulties managing their asthma. This may lead to discomfort, limitations to their daily activities, and stress for them and their families." The researchers found that rural parents had to travel 30 minutes longer to access healthcare for their children, compared to their city counterparts. The research, which was Oluwole's Ph.D. project, was published in the Journal of Asthma and compared data from children and teenagers who lived in urban and rural areas. "The issue of asthma underdiagnosis in rural areas is complex but the longer time to travel to obtain health care may impact rural parents' decisions to take their child to a healthcare facility," said Lawson, a professor in the College of Medicine and Oluwole's former supervisor. The researchers, who work at the USask Canadian Centre for Health and Safety in Agriculture, have surveyed the families since 2013 and tested the children with equipment for lung health measurement. The self-reporting survey indicated that almost 21 per cent of urban children had asthma, versus 15 per cent of rural children. The researchers then tested almost 290 children with equipment for lung health measurement. They used spirometry, which measures how much air someone can breathe out and how fast, and an exercise challenge test (ECT) that helps determine airway responsiveness by having children complete step-ups. The testing showed rural children without a history of diagnosed asthma based on survey responses were more likely to be reclassified as having asthma compared to urban children. "School-based screening programs designed to meet community needs could help improve children's asthma diagnosis in Saskatchewan rural areas, so parents and children won't have to travel long distances," said Oluwole. 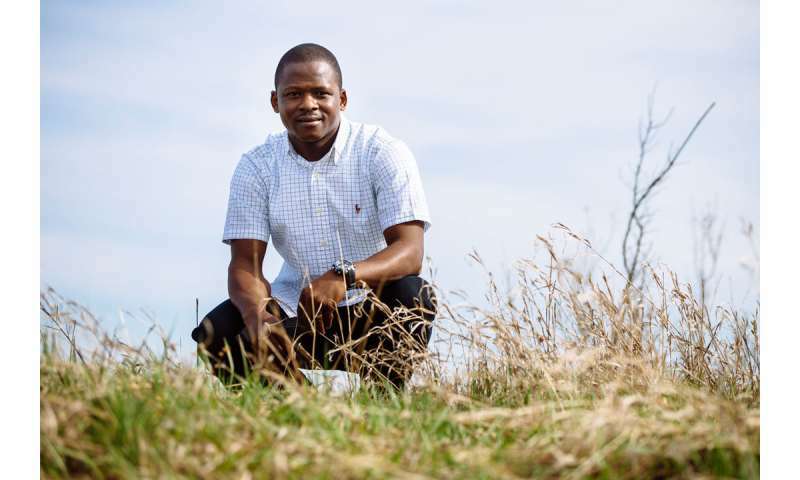 The issue of asthma underdiagnosis in rural areas is a topic that hits home for Oluwole. When he lived in Nigeria, his home country, his best friend died from a severe asthma attack. "My friend never realized he had asthma in the first place and he exposed himself to dust," he said. "Ignorance put my friend at risk, so I was inspired to pursue asthma research to help prevent or reduce further tragedies, especially among poor and vulnerable people." Once at USask, Oluwole received $150,000 over three years through a Vanier scholarship, a competitive federal award that recognizes top-tier doctoral students who demonstrate excellence in academia, research impact and leadership at Canadian universities. Oluwole's next step is to track how and whether asthma changes over time in children in urban and rural areas, and what factors are at play.